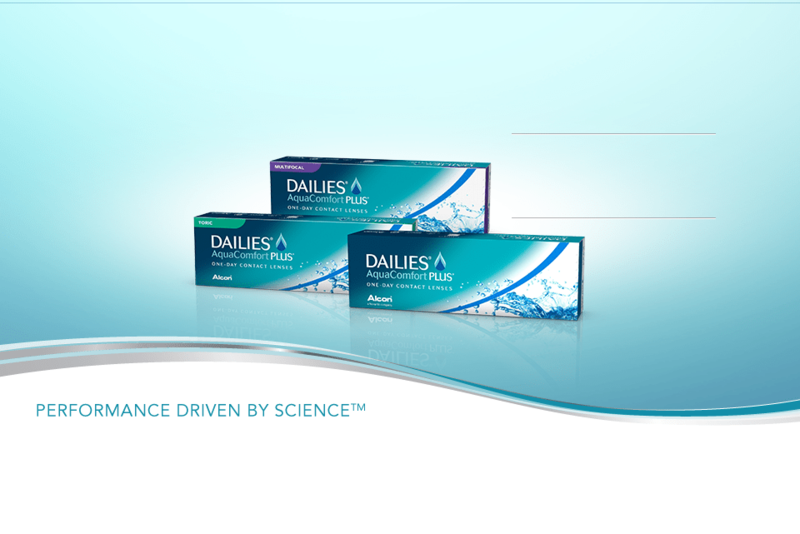 Dailies AquaComfort Plus contact lenses, Dailies Aquacomfort Plus Toric contact lenses and Dailies AquaComfort Plus Multifocal contact lenses and are a fairly economical option for someone who would like to wear daily disposable contact lenses and obtain the benefits of daily disposable contact lenses without breaking the bank. They aren’t the newest technology in the daily disposable area, for example newer lenses such as the Dailies Total 1, by the same company is more breathable and includes water gradient technology for improved comfort. But, it still can be worth switching to a daily disposable wear lens from a two-week or monthly lens because of the benefits of convenience, removal of solution sensitivity, and a reduction in the chance of contamination from storage your storage container. You can purchase Dailies AquaComfort Plus contact lenses from our office with just a phone call. If your last contact lens exam was with us, we’ll have your prescription on file for you, so there’ll be nothing you have to do other than give us a call and let us know how many boxes you’d like. If you pick your lenses up at our office then there’s no shipping charge, and it only takes a day, or sometimes two, for your lenses to arrive at our office. We can also ship your Dailies AquaComfort Plus contact lenses directly to your home. Shipping is free on annual supplies shipped to your home. If it has been more than a year since your last contact lens exam, you will need a new eye exam and CL fitting or evaluation to ensure that Dailies AquaComfort Plus contact lenses are still the best choice for your ocular health and vision. You can schedule your contact lens exam online or call our office with any questions.